In the West, it is often a decision made by each household as to whether shoes are to be removed before entering the home. In Japan however there are customs that are followed almost universally when it comes to where and when footwear is worn. 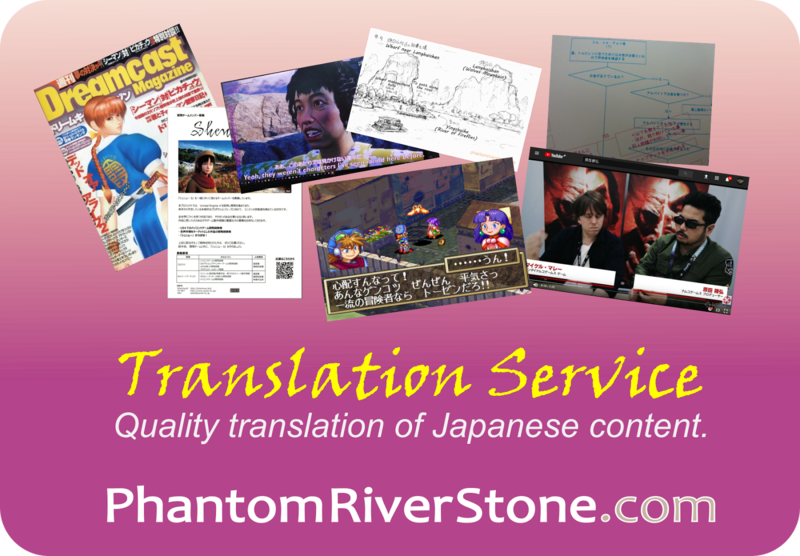 If you ever visit Japan, this is something you will come across wherever you go: at your accommodation, out sight-seeing or visiting friends. 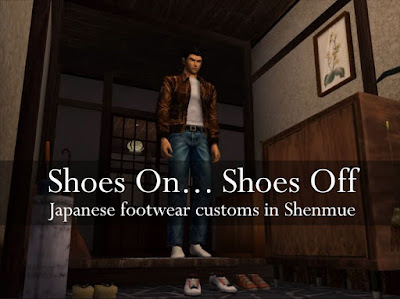 The first Shenmue game does a great job in reflecting these customs naturally as part of the story, and it is also interesting to examine Shenmue II in the same light. The entrance-way to a Japanese house is called the genkan, and it consists of a flat surface just inside the front door that sits at the same level as the outdoors, with a step up to the main area of the house. The concept is that outdoor footwear is removed in this lower area before stepping up to the inner hallway, in order to avoid tracking dirt inside. 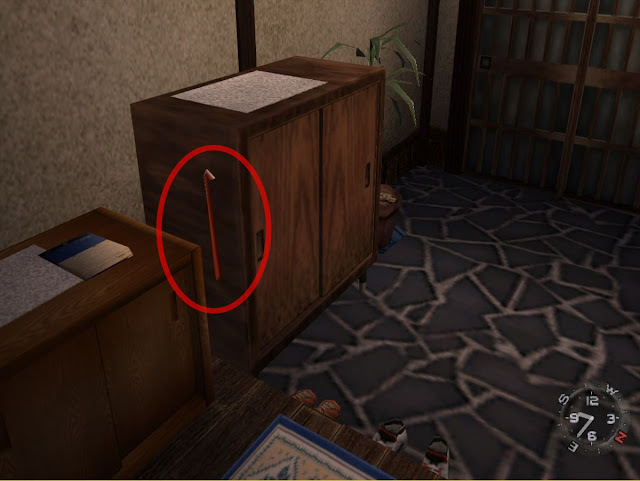 It is remarkable that this detail is captured in Shenmue, with a smooth but brief animation for Ryo whenever the player moves him into the house. His discarded shoes can be seen on the ground behind him after he has stepped up. 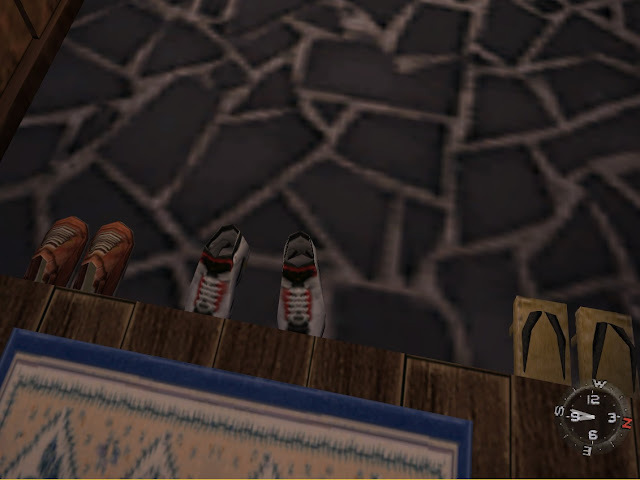 Center: Ryo's discarded shoes after entering the house. Right: a pair of wooden "geta" or traditional Japanese clogs, probably belonging to Iwao. If you are a guest at someone's house in Japan, your host or hostess will often turn your shoes around for you so they are facing the entrance-way, ready for when you leave. 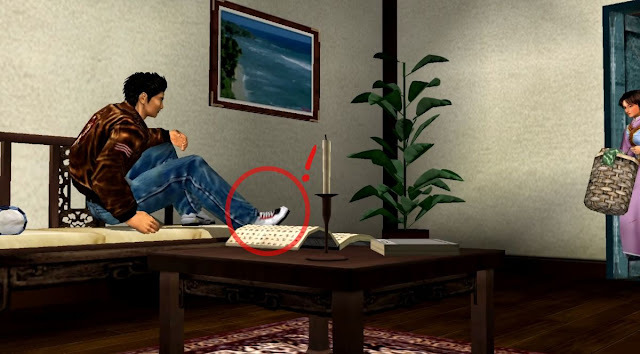 (In the game, Ryo's shoes are "magically" facing in the right direction just before he steps down into them to leave the house). Ryo looking serious as always as he prepares to step into his shoes again. Once inside the house, it is common for slippers to be provided for guests to use. In Ryo's house, the wooden rack that can be seen to one side is a slipper rack that holds a few pairs of slippers (one slipper fitted inside the other and slotted onto short wooden posts), although we never see members of Ryo's household actually wearing any inside. Pairs of slippers in the slipper rack. Here's a similar one in real life - this heavy wooden style of rack would be considered "retro" or old-style these days. More modern designs use wire and stand vertically to reduce the space they take. 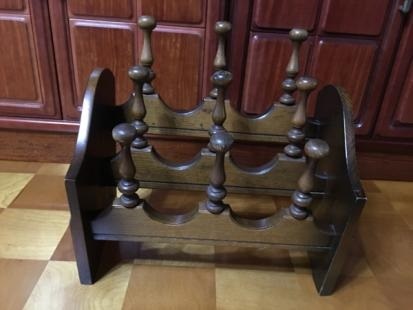 A real-life wooden slipper rack similar to the one at the Hazuki house. Another item that can always be found somewhere close by in a Japanese genkan is a shoe horn, to help people fit their shoes back on again when leaving. In Ryo's house, we can see an orange shoe horn hanging on the side of the shoe cabinet. An orange shoe horn hangs on a nail. The long handle avoids the need to crouch. In Japanese tatami-mat rooms, slippers are a no-no and must be removed in the hall before entering the room. In Shenmue, members of the household don't wear slippers around the house, so this isn't shown in the game. In reality, slippers would normally be worn in a traditional house like this, especially during the cold winter months. 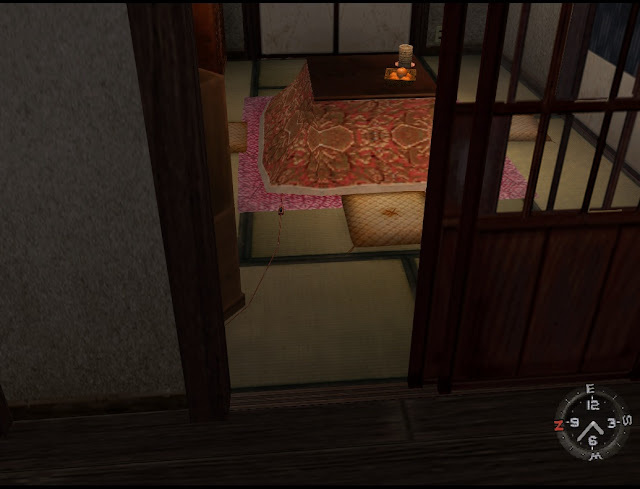 Tatami room: remove your slippers before entering. In addition to the general "indoor" slippers in Japanese houses, there is generally a separate pair slippers provided that are specifically for use in the toilet. They often have "W/C" or a symbol marked on them to distinguish them. A common faux-pas made by visitors to Japan is to change into the toilet slippers inside the toilet, but to forget to change back, causing consternation to their Japanese hosts as they tramp around the rest of the house in them. 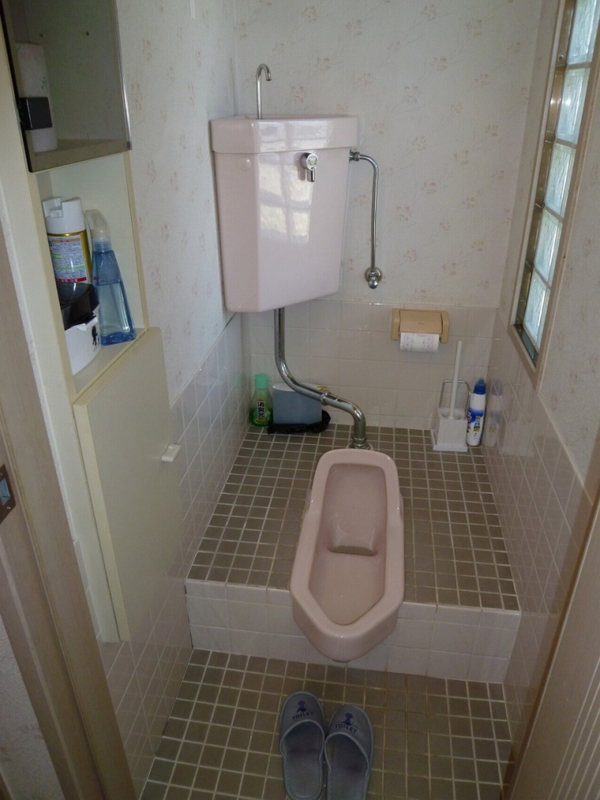 Ryo's home contains a detailed reproduction of an old-style squat toilet (although these are becoming less commonly seen these days, as they have often been upgraded to Western-style toilets). The water tank in the corner serves as a place to wash your hands, with a small jet of clean water streaming out to refill the tank after the toilet is flushed. 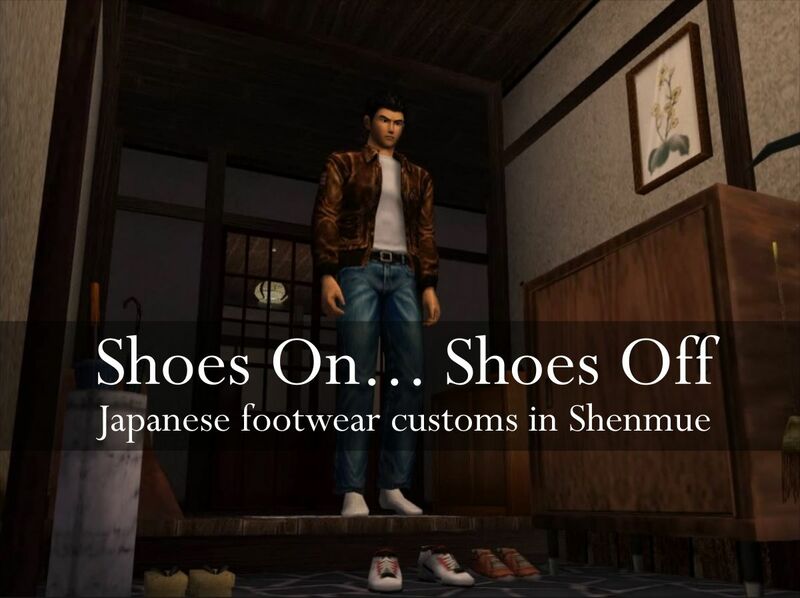 But in Shenmue the toilet-only slippers are nowhere to be found inside the room. Perhaps Fuku-san accidentally wore them back to his room...? Ryo has no need for this in the game. 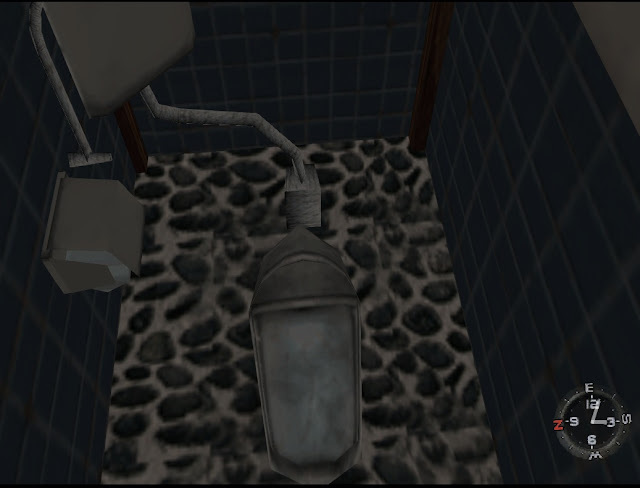 In real life, "toilet slippers" are generally provided. Ryo's shoes at the steps of the Hazuki Dojo. ...but his encounter with Lan Di at the start of the story is a notable exception. The presence of Ryo's shoes still on his feet convey his frame of mind. 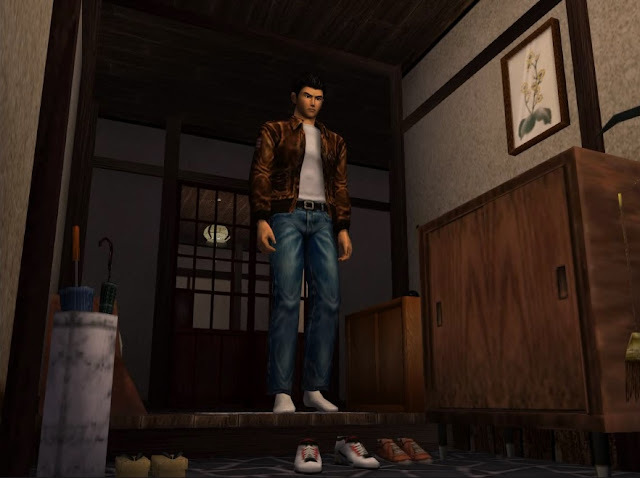 Having Ryo leave his shoes on as he enters the Dojo at this point in the intro sequence is an effective detail, as it helps to emphasize the urgent state of mind Ryo must have been in as he sprinted up the stairs and into the room in his shoes to go to the aid of his father. 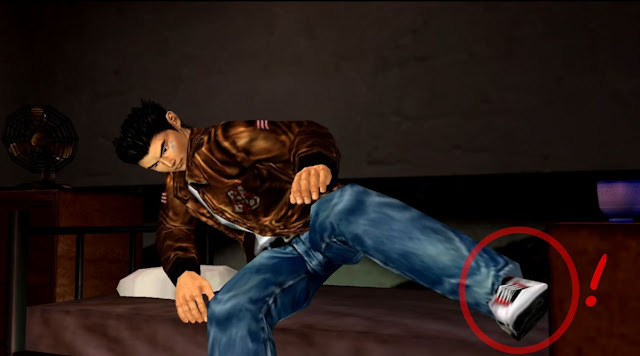 In contrast to the care Ryo takes in the first Shenmue game with regards to removing his shoes, in Shenmue II Ryo is rather more lax. Let's have a look at some of those instances. Firstly, he leaves his shoes on when sleeping at the Come Over guest house, as can be seen when he arises in the morning. Well, the manager of the Come Over Guest House probably won't notice. 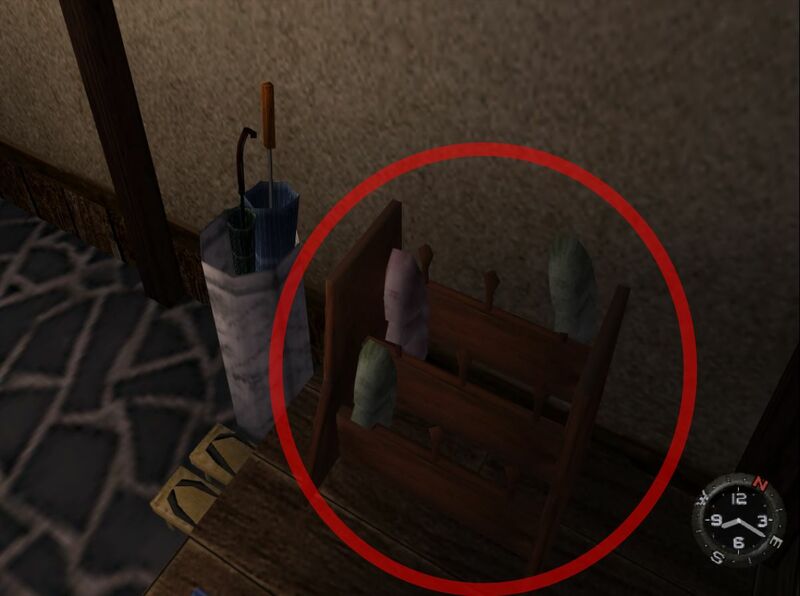 Nor does he bother removing them when sleeping on the sofa in Xiuying's room. Xiuying may not be so happy at the way Ryo treats her furniture. 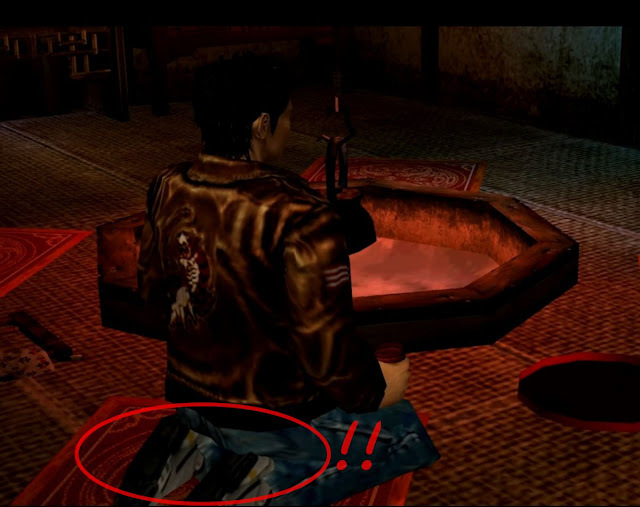 Most perplexing of all, however, is that he even leaves his shoes on in the woven-mat section of Shenhua's house, even kneeling on a cushion in them. Caught red-handed... er... -footed at Shenhua's house. Leaving shoes on in the above situations is something that I don't think a Japanese person would ever do accidentally, since removal of footwear is something that comes as second-nature. Yet at the same time, as cool as Ryo's character is, he is always well-mannered and would not deliberately want to offend Xiuying or Shenhua. 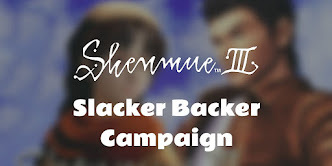 I wonder if the extra expense for creating the animations was not felt to be justified for the second game. 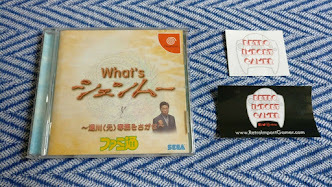 I would love to be able to hear Yu Suzuki's comment. 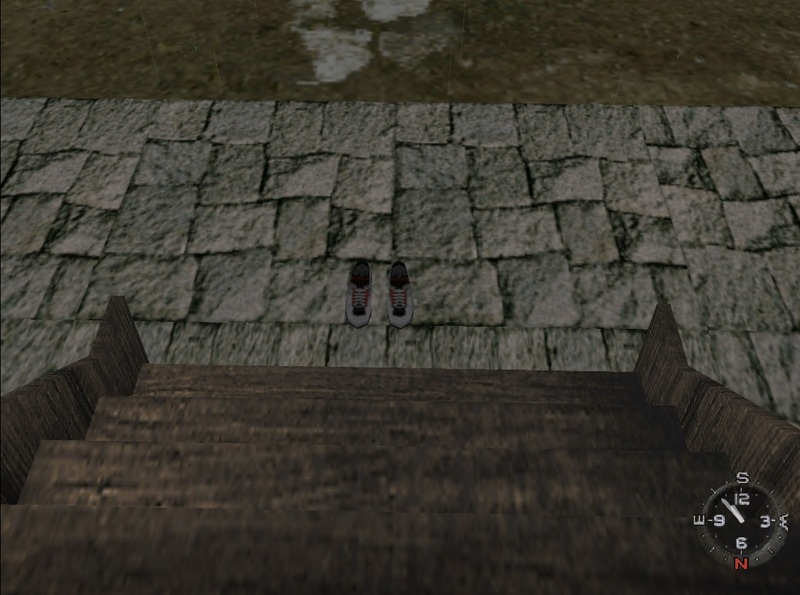 Feel free to leave a comment below about the footwear in the game, or a country you have visited! Always so interesting Switch! Thanks so much for this well written pieces! Thanks for dropping by as always, SkillJim! In Canada we tend to take our shoes off :). Great article. Interesting to know! It's a custom that totally makes sense to me. It's something to consider! Perhaps a reader who has lived in China could comment on the customs there. 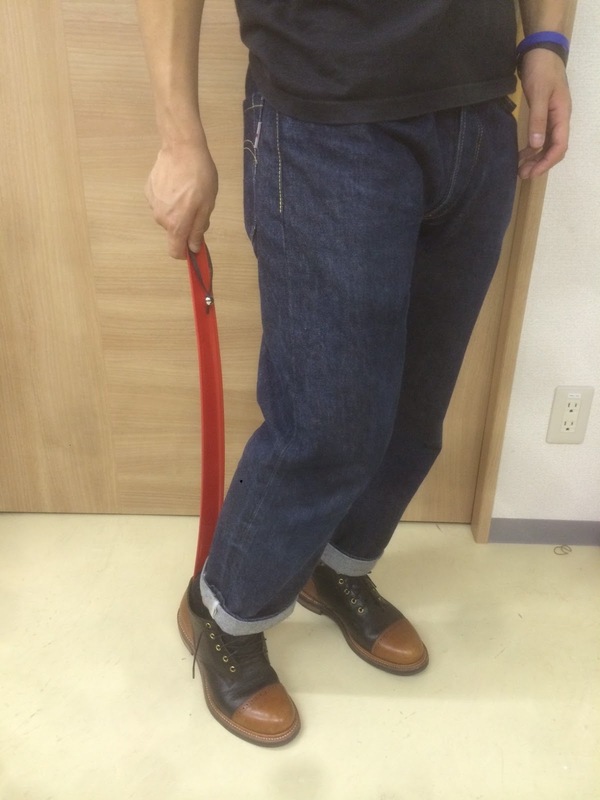 This custom is ingrained for Japanese people though so my take is that it would be natural for Ryo, being Japanese, to remove his footwear in such situations, regardless of the country he goes to. As well as simply showing his respect as a guest. Out of interest, my parents have always made anyone (including my siblings and I) take our shoes when entering the house. So whenever I go to another person's residence I always take my shoes off. Have never really worn slippers though, always preferred my feet to be free. 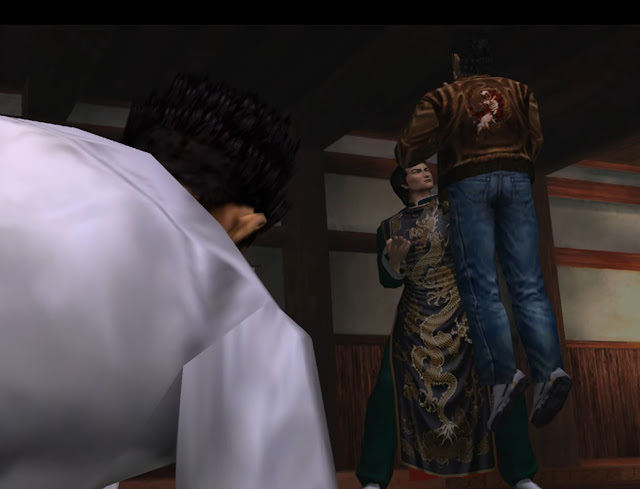 In Shenmue II, I think they just overlooked Ryo's habits due to the change in setting. But it would be interesting to know what the custom's are in China. I hope the Come Over Guest charged Ryo extra for his lack of hygiene! Thanks for commenting! Removing footwear inside isn't something I was used to before coming to Japan, but once you're used to it you can never go back, can you. I would also like to hear what Yu Suzuki would say about Ryo leaving his shoes on in Shenmue II. I really liked how it was done in the first game, but I never really noticed that he kept them on during the times you pointed out in this brilliant article. Great insight as always Switch!! Another very interesting article Switch! I'm firmly in the 'shoes off inside' camp, it's considered polite here in England to at least offer to take your shoes off when entering a house, but not all people offer to do so. These types of articles are so interesting to me! In Japan on the train I occasionally see tourists casually putting their feet up on the seats facing them, and sense the quiet horror of the other Japanese passengers!